Grilling shrimp brings out its nutty flavor. 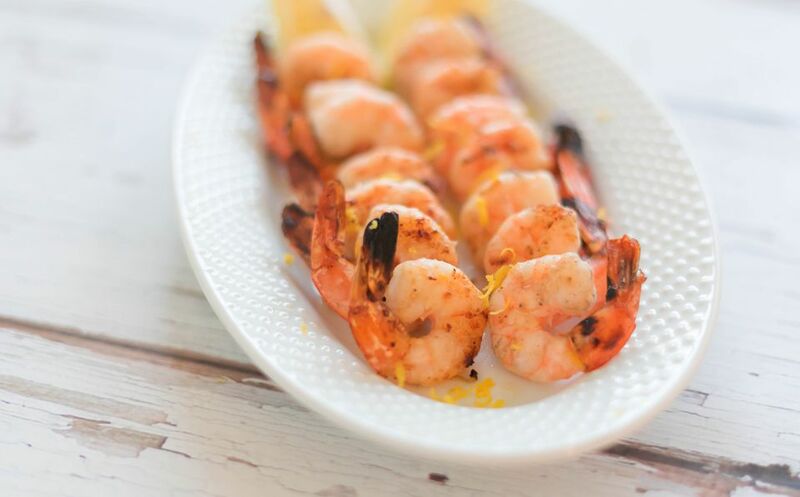 Brushing those grilled shrimp with a bit of lemon butter gives them a lovely fresh zing. Shrimp can be grilled with the shells on or off. Leaving the shells on helps ​to intensify their flavor and keep them moist. Taking the shells off, obviously, makes for easier eating. Heat a grill to medium-high (you should be able to hold your hand about an inch over the cooking grate for 3 to 4 seconds). Thread the shrimp onto skewers or place in a grilling basket, if you like. Melt the butter and set aside. Zest a lemon and put the lemon zest in the butter. Squeeze about 2 teaspoons fresh lemon juice into the melted butter and stir or whisk to combine. Brush the shrimp with the resulting lemon butter. Set the shrimp skewers, basket, or plain oiled shrimp, on the hot grill. Cook until the shrimp starts to turn pink, about 1 minute. Brush with more of the lemon butter. Turn the shrimp over to cook on the other side and cook until just cooked through (be careful, since overcooked shrimp gets terribly tough). This is usually about 1 or 2 minutes, depending on the size of the shrimp. Brush the shrimp with any remaining lemon butter and serve shrimp hot.